Our entire funeral home family are caring and experienced professionals who understand that each family is unique and has personal requests and traditions. These requests and traditions are of utmost importance to our entire staff of licensed funeral directors and family service associates. Matt grew up in rural Wilmington and is a son of Violette (Hansen) Baskerville and the late Robert M. Baskerville, Jr.
Matt graduated from Wilmington High School and attended Joliet Junior College, National Louis University in Evanston and Northwestern University, as well as Worsham College of Mortuary Science. Matt has worked with the Reeves family since the age of 12. 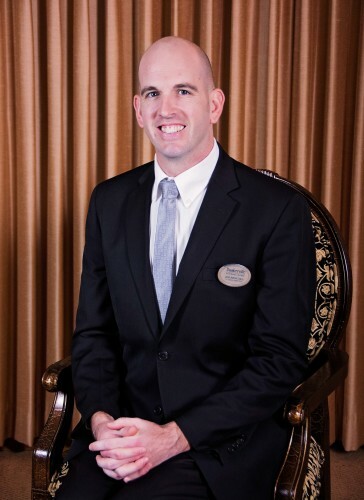 Matt has been a licensed funeral director since 1995, holds an Illinois Life Insurance Producers License to handle prepaid, prearranged services, has been designated by the National Funeral Directors Association as a Certified Preplanning Consultant (CPC), as well as a Certified Crematory Operator (CCO). Matt also earned his designation by the Academy of Funeral Service Practice as a Certified Funeral Service Practitioner (CFSP). He is also a Certified Funeral Celebrant, having acquired his training through the Insight Institute with reclaimed author and bereavement educator Doug Manning and Glenda Stansbury. Matt is a member of St. Rose Parish in Wilmington, where he has been involved with the music ministry since 1987, and formerly served on Parish Council. He is currently a member of the Wilmington Rotary; serves on the Board of Directors for Oakwood Cemetery Association in Wilmington, and is the acting Secretary, and a Board Member for The Wilmington School District 209-u Foundation for Excellence. Matt is involved with the National Funeral Directors Association, and is honored to have been selected as a committee person for their Pursuit of Excellence program. In Matt's limited free time, he enjoys traveling, collecting antiques and enjoying the theater and arts. Alex is a Funeral Director that has been working full-time for Reeves and Baskerville Funeral Homes since April of 2014. He previously served his apprenticeship here as well from 2011 to 2012. Alex is a graduate of Reed-Custer High School, Class of 2007, in Braidwood where he was raised, and Worsham College of Mortuary Sciences where he achieved an Associates of Applied Sciences degree. He currently resides in Minooka with his beautiful wife Katrina, and in his free time enjoys supporting Chicago sports teams, especially the Chicago Cubs and the Chicago Blackhawks. 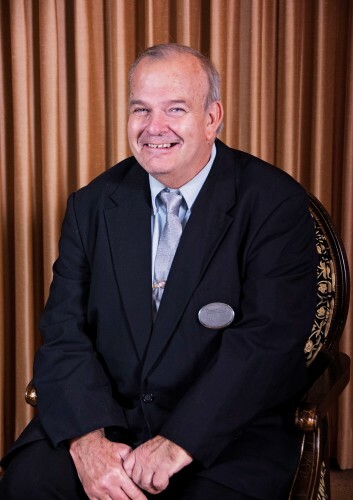 Jim is a funeral director who has been a part of the Reeves and Baskerville staff since August of 2016. Jim is a graduate of Reed-Custer High School in Braidwood, class of 1998, and later a graduate of John A. Gupton College in Nashville, Tennessee where he received an Associate of Arts degree in Mortuary Science. He currently resides in Bolingbrook with his wife, daughter and two dogs. In his free time he enjoys playing his drums, listening to music, watching movies and going on long runs. Katie is a King Charles Cavalier Spaniel, and her primary job to to provide comfort and smiles to those who come into the funeral homes. Katie is a graduate of the AKC Good Citizen Program, and is awaiting to become enrolled into a Grief Therapy Program in mid-2019. Violette Baskerville is her full time and primary handler. Katie has become our most popular staff member since joining the family in July 2018! John joins the Reeves and Baskerville team with a background in banking, finance and insurance. John works primarily out of our business office in Coal City, but also enjoys serving families as a funeral assistant and family service coordinator. He has been certified by the National Funeral Director's Association as a Certified Pre-Planning Consultant. Violette joined Reeves Funeral Homes, Ltd. in the Fall of 2008 after retiring from The Harford Financial Services in Aurora. Violette is the daughter of Ellen (Stott) Allen of Missouri and formerly Morris, and the late Frank Hansen. She was raised and educated in Morris and currently resides in Wilmington. Violette is the mother of: Michael (Patricia) Baskerville of Coal City and Matthew Baskerville of Wilmington, and she has three grandchildren. Violette assists Matt in working with families during advanced funeral planning and at time of need. Violette is licensed by the State of Illinois as an insurance producer, has earned her credentials as a Certified Funeral Celebrant and was designated by the National Funeral Directors Association as a Certified Preplanning Consultant. She is instrumental with our advanced funeral planning program and also works with families to create personalized cemetery monuments and memorials. Violette is based out of the Wilmington funeral home office, however is available anytime, at any one of our locations. Sheila joined Matt Baskerville in 2011 as a visitation attendant and now works with the entire Reeves and Baskerville team full time out of our business office in Coal City. Sheila also enjoys working and assisting families during visitations, funerals and throughout the community year round. Born in Streator to Ralph and Marge Yedinak, Jan attended schools in Ransom, Seneca and Morris. She is a 1964 graduate of Morris Community High School and attended Joliet Junior College, where her studies focused in Psychology. Jan married Ron Hibler in 1971 and worked with Ameritech and A.T.&T. for 30 years, until retiring in 1994. After retirement she began working part-time with Ruby Begonia's Boutique in Morris in 1996, and that is where you can still find Jan on various days when she is not greeting families and guests at one of our funeral homes. Jan has been a volunteer with Grundy Community Hospice since 1997, and served as Hospice Auxiliary President since 1999. She is an active member of Saint Mary's Catholic Church in Minooka since 1980 where she sings in the choir and serves as a Eucharistic minister. Jan is a member of Cantigny V.F.W. Auxiliary in Joliet and enjoys being an active member of the Grundy County Historical Society, where she takes great pleasure in the annual Festival of Trees fundraiser. In her free time, Jan loves gardening, decorating and antiquing. She cherishes her nieces and nephews and enjoys helping and caring for others. Jan is happy and proud to be a member of the Reeves and Baskerville funeral homes team, and we at the funeral homes are equally as honored to have her represent and be a part of our funeral home family. Sandi is a very caring and compassionate person. She also is a volunteer for many organizations. Sandi retired from the Grundy County American Red Cross in 2005 after 25 years of service, however still remains active with the Red Cross as a volunteer. She and her husband Dan have responded to many national disasters, including hurricanes: Rita, Isaac, and Sandy, as well as locally during the Illinois Floods and the Diamond and Coal City Tornadoes. Her dedication to the Red Cross has at times deployed her for weeks at a time. Sandi is active with the Grundy Community Volunteer Hospice, where she serves as the Secretary for the Auxiliary board. She is on the board, and has been past President of the Grundy County Historical Society, where she was proud to be very involved in the committee for building the new Historical Museum in Morris. Sandi's hobbies entail traveling, genealogy, gardening, decorating, boating, camping, family, friends, and attending all of her grand children’s activities. Sandi currently resides in Morris with her husband Dan. She has two grown children, daughter Michelle and son Kelly. She also has four beautiful grandchildren. 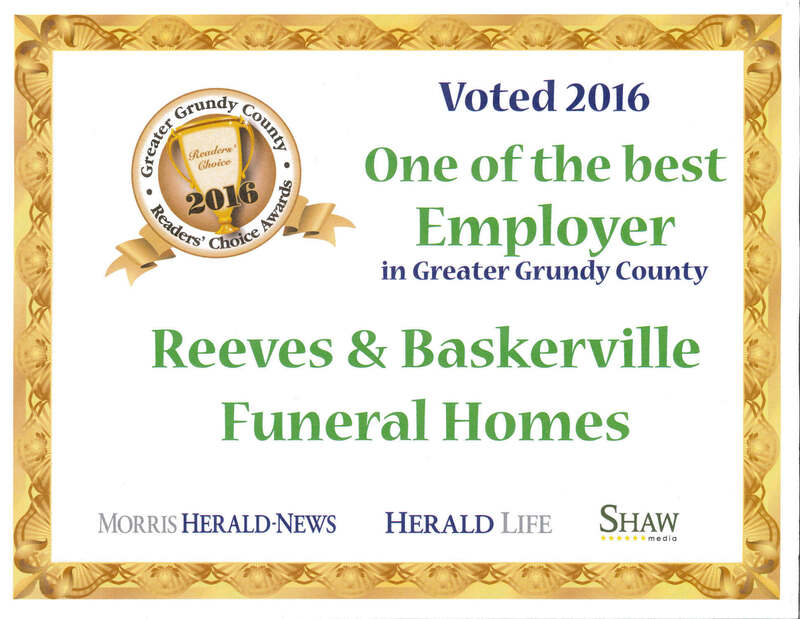 Sandi has been working visitations with Reeves & Baskerville Funeral Homes since 2013. She feels so honored to be part of such compassionate and dedicated professionals, who are of the highest integrity.